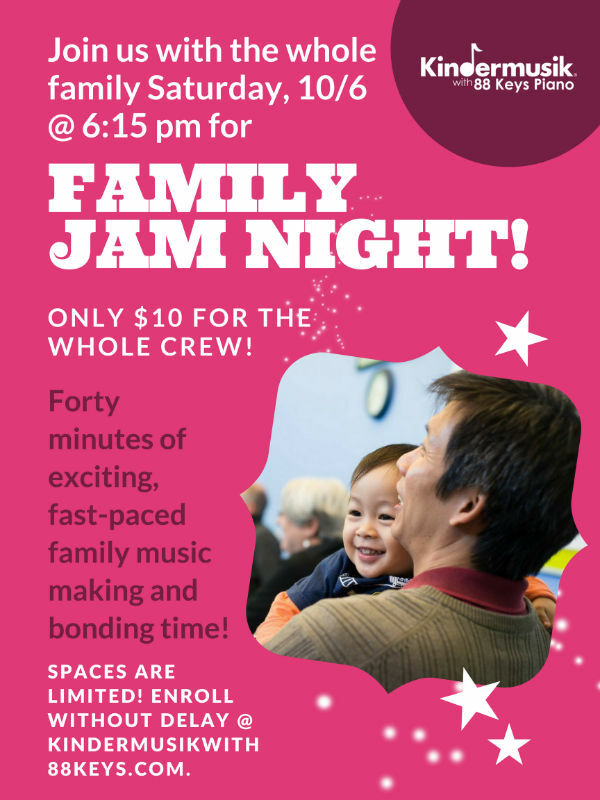 There’s still room for you this Saturday at 6:15PM for Kindermusik’s Family Jam Night! Bring your 0-7 year olds for an exciting time of music, instruments, movement, singing, books and more with Kindermusik Savannah with 88 Keys Piano . Cost: Only $10 for the whole family. Baby class for 0-24 month olds is underway and meets each Tuesday at 11AM. Newborn to 10 week olds can come tuition-free! Kindermusik Savannah is starting a brand new Saturday weekly class for 0-7 year olds. Email with your preference of 9AM or 11AM. Visit kindermusikwith88keys.com or text 912-432-5885 to set up your free introductory class today. This entry was posted on Sunday, September 30th, 2018 at 12:38 am	and is filed under Art/Culture/Entertainment, Classes/Programs, Kindermusik Savannah, Mommy & Me, Music, Pre pre-schooler activities. You can follow any responses to this entry through the RSS 2.0 feed. Both comments and pings are currently closed.